Tesla shares have been gaining around this week – but investors on the free-trading app Robinhood appear to be selling the stock. The rally comes as short seller Andrew Left changed his view on Tesla and bought the stock ahead of the electric-car maker’s crucial third-quarter results. Tesla is set to report earnings after Wednesday’s closing bell. Tesla shares have surged 13% this week, but investors on Robinhood, a no-fee trading platform popular among younger investors, are betting that the positive news has been priced in ahead of the company’s third-quarter results, which are due out after Wednesday’s closing bell. According to weekly data tracked by Business Insider, Tesla saw the biggest drop in the number of Robinhood investors – with a net of 2,692 investors selling their holdings since last Thursday. Currently, a total of 109,315 investors currently hold Tesla shares, making the electric-car maker the 14th most-popular stock on the app, down one spot from last week. 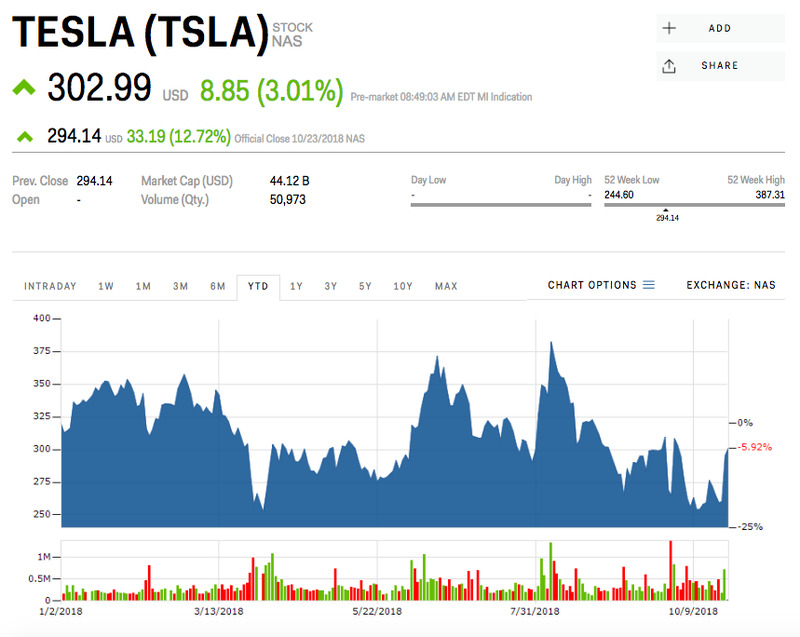 The recent rally comes as short seller Andrew Left, who filed a lawsuit against Tesla in September over CEO Elon Musk’s taunting of short sellers, did a 180 on the stock and bought shares ahead of the company’s crucial third-quarter earnings report. Left noted that Tesla is “destroying the competition” in the electric-vehicle market, and that Tesla will generate more than enough cash and prove its sustainability in the near term, echoing what Musk has told employees – that the company will achieve profitability this year. Earlier this month, Tesla said it delivered 55,840 Model 3 sedans in the third quarter, beating its own guidance of 52,425 and Wall Street’s expected 55,600. The electric-car maker also said it’s on track to deliver 100,000 Model S and Model X vehicles for 2018. And last week, Tesla announced a lower-priced version of its Model 3 sedan, starting at $US45,000. In California, the cheaper model will cost $US35,000 after federal and state tax rebates, Musk said. Now, all eyes are on Tesla’s third-quarter earnings report, which was moved up to Wednesday afternoon. Wall Street analysts surveyed by Bloomberg are expecting an adjusted loss of $US0.15 a share, a significant improvement from the previous quarter, on revenue of $US6.32 billion. Their average price target is $US301 – about 2% above where shares were trading on Tuesday. Tesla stock was down 6% this year through Tuesday.